It's been a long time since any of my items have been selected to be part of a treasury. 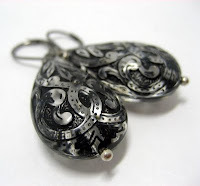 Thus I am so thrilled to get a convo from VintageLegacyStudio telling me that my Black Lace Drop earrings have been included in her "Mystery of the Black Lace" treasury. The treasury features a collection of items that uses black laces or have intricate designs similar to black lace. This necklace is BEAUTIFUL! I never knew crochet items can be so elegant and chic. I used to associate crochet with grannies.. but never again after stumbling upon this beauty. These earrings are so chic. I love the use of black lace (something so vintage, traditional) paired with something so modern and chic for everyday wear. Last but not least.. my very own Vintage Black Lace Drops. These earrings are always with me whenever I wear something Black (which is most of the time). I love them as the intricate lace designs are engraved onto a clear acrylic background. Beautiful earrings that will last a lifetime. I've hit a dry spell with treasury inclusion too....Congratulations on being featured in such a great treasury. Now THAT is a beautiful treasury to be featured in. Your earrings fit right in. Congrats. That black lace crochet choker is stunning! I love it! And I want it :) I need to check out that store. Thanks for highlighting these finds and congrats on being included in that beautiful treasury! I love that necklace too. Very classy.